The U.S. Wide Area Augmentation System (WAAS) and European Geostationary Navigation Overlay Service (EGNOS) are examples of satellite-based augmentation systems (SBAS) that employ additional ground stations and satellite transponders to improve the accuracy and reliability of existing satnav services across various geographical regions. These performance enhancements enable GNSS to be employed for “safety-of-life” services, especially aviation. Such systems are primarily based on GPS for now, but plans are being laid to move to a multi-constellation design employing signals from Europe’s Galileo, China’s BeiDou, and Russia’s GLONASS GNSS systems beyond 2020. The latest 28th Satellite-based Augmentation Systems Interoperability Working Group (IWG), planning standardization of SBAS systems to come, was hosted at the European Space Agency (ESA) ESTEC technical center at Noordwijk, the Netherlands, on April 1–3. All participants unanimously endorsed the “message definition” for a new secondary SBAS channel — to be known as L5, along with the current L1 — for the planned second-generation SBAS systems, which will use dual-frequency, multi-constellation signals. 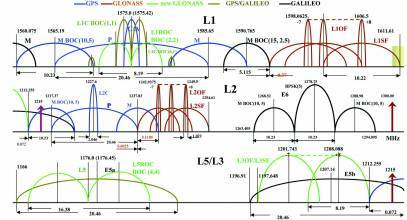 Using dual frequencies increases the accuracy of navigation systems by enabling receivers to calculate and mitigate adverse environmental effects on GNSS signals propagating through the ionosphere — an electrically active outer layer of Earth’s atmosphere. “This definition is presented in what is called the Dual Frequency Multi-Constellation Definition document,” explained Didier Flament, representing ESA. “It represents the outcome of a four-year activity, which started at IWG 19 in Japan, back in 2010.” The effort was coordinated among all IWG members under the technical leadership of ESA and the French space agency CNES on the European side, and the Federal Aviation Authority (FAA) and Stanford University on the U.S. side. The formal IWG review loop for the document took six months to conclude, with the recent IWG 28 then allowing endorsements to be gathered by SBAS project managers, culminating in formal signatures to the document. IWG members now intend to have this document accepted by the official international SBAS standardization bodies: the International Civil Aviation Organization (ICAO), the U.S.-based RTCA, Inc. (formerly the Radio Technical Commission for Aviation), and the European Organization for Civil Aviation Equipment. The meeting also reported on the state of development of the other global SBAS systems. Along with the four operational systems — the WAAS, EGNOS, Japan’s Multi-functional Satellite Augmentation System (MSAS), and India’s GPS-aided geo-augmented navigation or GPS and geo-augmented navigation system (GAGAN) – these other systems are South Korea’s KASS, China’s BeiDou SBAS, Russia’s System for Differential Corrections and Monitoring (SDCM), and the West African Agency for Aerial Navigation Safety in Africa and Madagascar (ASECNA) SBAS. A follow-up IWG meeting will take place in October, hosted by the FAA in Washington D.C., in conjunction with the next RTCA meeting.